IDX – Do we really need it? I talk to a lot of REALTORS and in my conversations, the topic of IDX (Internet Data Exchange) or as some call it Broker Reciprocity frequently comes up. The first question I always seem to get is “Well do I really need it?”. From my prospective the answer is YES. But why do we need to share our listings? I think the first thing that comes to mind is the fact Agents have been sharing listings for many years already. The whole spirit of the MLS is cooperation and the foundation is the sharing of listing information so the buyer can have the broadest array of data to make the most informed decision. The big old book of yester-year has now been replaced by online listing data. This is the next natural progression of how we share listing information. With that said, the typical buyer that comes to your website is looking for online listing information and if you are not supplying it, someone else will. Well Generation X and beyond have grown up on the Internet and want to see listing data at their finger tips. Take Website A – Lets say this Agent’s website is in New Jersey. We’ll call him John. Now John is a hard worker and has 3 active listings in Oradell and the surrounding towns. His office has 10 more on top of that. Now Sally was surfing the Internet and found John’s site. She is looking for a home in Oradell and John has 1 of this own and 2 from the office. So Sally has 3 to choose from. 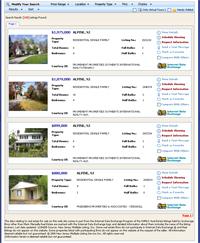 Now mind you, there is actually 35 active listings in Oradell right now. Being an typical Internet user Sally wants her information online and she wants is NOW. How do we know that? So because Sally knows she can find more listings elsewhere she will probably click back to google and look at the next website. Now if John had IDX on his website he would have been displaying all 35 active listings, the same amount of listings at REALTOR.com for example. What compounds this is when someone finds him and searches his site for a listing out of his marketing area (like maybe 15 miles away in the Northern part of the county). In this case he might have zero results while an IDX search might yield 50 or more results. I think you are getting the picture here, right? Now don’t think that IDX brings you leads, all IDX does is help you retain them. You still need to do your marketing and have a well maintained website. The typical IDX add-on costs from free to a high price of around $40 per month. So for a high of $420 per year it is an overall small investment in your marketing budget. One referral in a year can fuel an IDX investment, think about what one sale does. Any good website today can benefit from IDX listings from both a “perspective new lead” benefit as well as using it as a client retention tool. So if your MLS offers this type of solution, give it a try. Don’t know how to get started, click here, to view our IDX solution and how to deploy it on your website. Previous postTemplate or Custom – What’s your flavor?